The Jersey City Police Department was in need of a Dive Trailer for their fleet. They had LDV build them a 35ft. 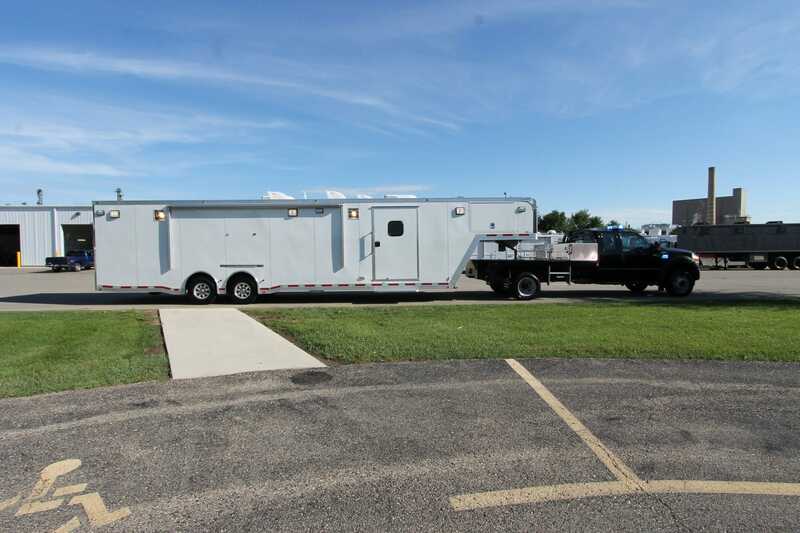 gooseneck trailer pulled by a Ford F550 XL diesel 4x4 Super Cab. The trailer is an ATC 16,800lb. GVWR all aluminum trailer with rear skid plates and LED clearance and brake lights and 7,000lb. Torsion axles (2). Inside, the trailer is upfitted with a galley kitchen complete with microwave, Keurig™ coffee maker and a 7.5cu. ft. refrigerator as well as a galley sink, interior shower and an exterior hose system. Water is provided by a 95 gallon fresh water tank and there is a 25 gallon black water and a 60 gallon gray water tank as well. Inside the trailer, fixed bench seating with removable cushions for storage, storage areas for SCUBA equipment and tanks, a Dometic retractable awning for shade and more. Whelen emergency lights on the outside of the trailer were also installed.